There are many decisions to make if you are having your kitchen remodeled or designing a kitchen for a newly constructed home--from countertop and cabinet materials to paint colors, fixtures, and appliances. Here are a few often-overlooked details to add to your list. Your faucet doesn't have to be centered with the sink. You may want to have the faucet centered on a window, wall panel, overhead lighting, or some other architectural detail. In addition, keep in mind that with a wall-mounted faucet, cleaning your countertops will be a cinch. Placing brackets under your countertop overhangs adds furniture-style detail to your kitchen without breaking the bank. Plus, brackets provide additional support, so you can breathe a little easier about how much weight an overhanging countertop can handle. A standard kitchen counter is three feet, but countertop height can be adjusted if the chef in your family is especially tall, short, or handicapped. Even if you decide to go with standard height kitchen countertops, you may want to have one small section of the top set lower to provide more leverage for chopping, kneading, and similar tasks. Questions? 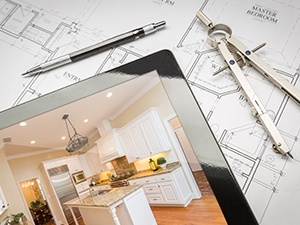 We are always available to help you work out every detail of your new kitchen design. Feel free to contact us any time. To Locate a Certified Stone and Tile PRO Partner in your area click here.